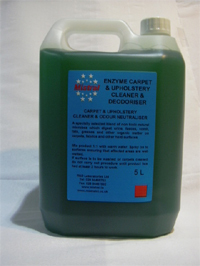 Aquaclean enzyme carpet / upholstery cleaner & deodorizer is a specially selected blend of non toxic natural microbes which digest urine, feces, vomit, fats, greases and other organic matter on carpets, fabrics and other hard surfaces. Ideal for use in nursing homes, hospitals, school washrooms, nurseries and playcentres, public toilets and anywhere unpleasant odours are located. As well as getting rid of the source of the problem a built-in fragrance leaves rooms smelling fresh. Mix product 1:1 with warm water. Spray on to surfaces ensuring that affected areas are well wetted. Leave for at least 2 hours to work before washing surface.